I’ve always loved art. As a mum of 3, I count it a privilege to explore art with the kids and to discover colours, swishes and blobs anew. It gives me a chance to experience this essential aspect of childhood that I remember fondly all over again. Vera also loves art. She lives and breathes in make-believe worlds of doodles and paints. Much of her free time daily is spent doing art with her fingers, and dabbling in crafts. It’s a bonding activity that I enjoy with her, like a special language shared between us. As Vera was going to move into her own “big girl” room, I decided to commission an art piece for her new room. 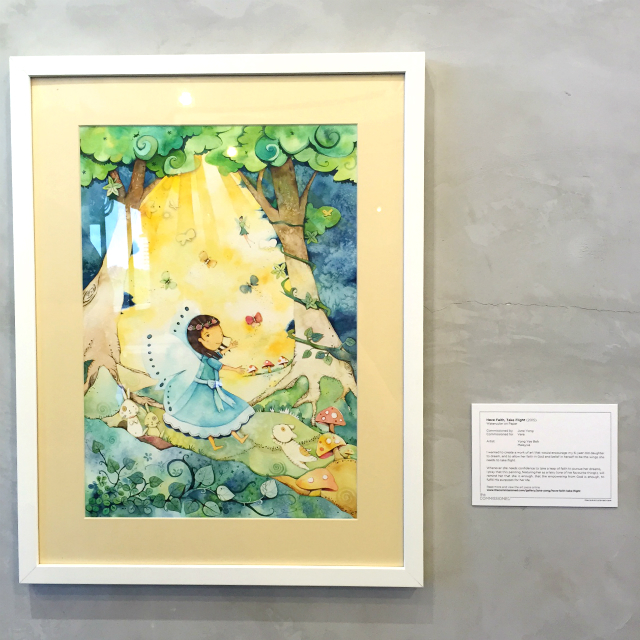 When I chanced upon this Penang-based artist, I was taken by her simple yet captivating style, that has such a child-like and innocent quality. 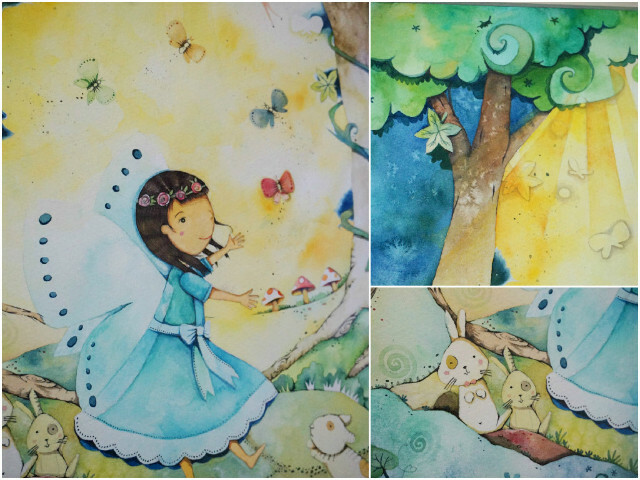 I knew that she would be the perfect partner to create a unique and original watercolour painting for Vera. I started a conversation with Yong Yee on The Commissioned’s website. In my note to her, I described the purpose and message behind the art work I was hoping to create. She followed up with some questions about Vera: What is her favorite dress? Does she have a pet? What’s her favorite book? I felt that this process enabled us to clarify and discuss ideas and also helped her have a better understanding of Vera. 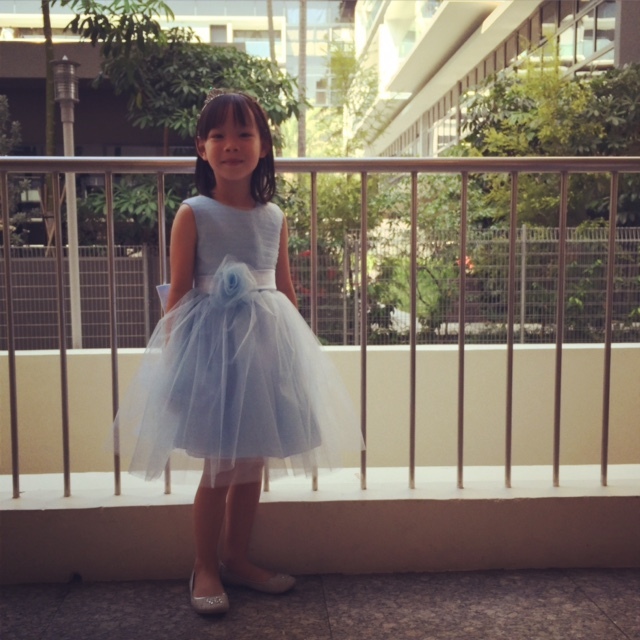 I also sent her a picture of Vera in her favourite blue dress. A couple of days later, she sent a sketch for my feedback / approval. I told her I loved the forest setting, and then asked if she could lengthen the hair of the fairy girl, as Vera has shoulder-length hair. A day or two later, colour had been added to the piece! It was exciting to see! Every couple of days, I received an update to the piece. It was really interesting to watch the details get added to the piece. I was also thankful that Yong Yee was really open to hear my ideas. Three-quarters into the piece, I asked if it was possible to add some rays of light from the sky. She considered my request and actually managed to pull it off really nicely! 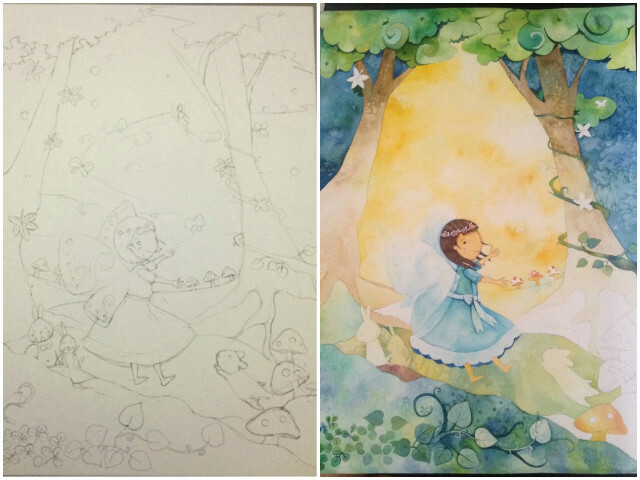 After I approved the final painting, all that was left to do was to fill in the “story” component of the art piece. The story then accompanies the artwork in a gallery text card. It’s also in the virtual gallery that has a unique URL for me to be able to share the piece with friends. Here’s a closer look at the different elements of the painting. I just love all the little details that Yong Yee put in the piece. 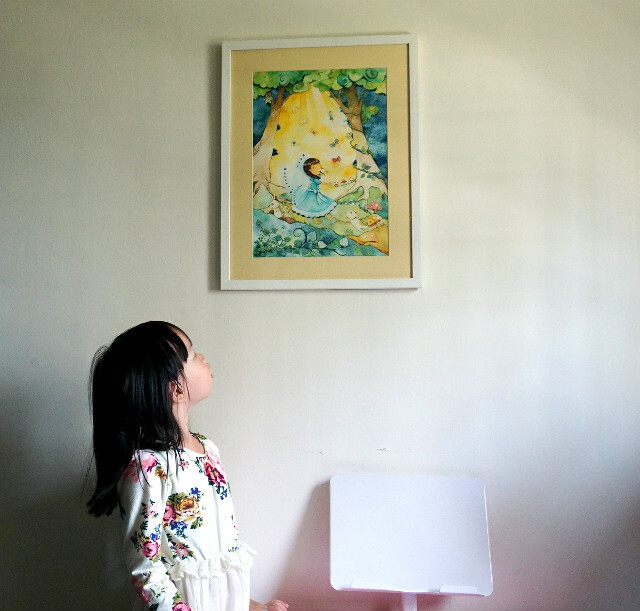 Now the painting sits happily in Vera’s new room. And it’ll greet her each morning when she wakes up, or when she reads at her desk. My prayer is that it will continue to inspire her in the days, months and years to come. To know and explore and use the gifts that God has given her, to fulfill His marvelous plans and purposes for her life. Commissioning an art piece was fuss-free, inspiring, and fun. I never really knew how my idea would translate into a painting, until I saw it unfold before my eyes. Being able to give my input along the way, and to see it materialise in the artwork itself was also very enriching. Through the experience, I’ve come to appreciate artists and the unique work that they do even more. Would you commission a work of art? If so what would it be and who would you give it to? That’s a beautiful piece of art especially for Vera. The story behind it is even more heart warming Mama June and may Vera always remember to go where her dreams take her. It’s really lovely! I like this style of water colour on textured cardstock too. You decided to leave out the balloons? I was searching for them in the final version but I suppose it might have been too much. This is nice! The art piece is beautiful, and so is the significance behind it. I am sure this will be a precious gift that Vera will treasure for life! I’ve never thought about commissing an art piece, simply because it sounds like such a serious and expensive affair but you’ve changed my perspective now! I think I will do this for my kids when they are older and have their own and rooms too! Welcome! I'm June, educational therapist, writer, and mother of three. I'm passionate about helping parents hold on to their inner calm and find joy in parenting. Journey with me as I share tips on emotional intelligence, managing behaviour, and bonding as a family.